Nevada became a state October 31, 1864, the 36th state admitted to the Union. On the eastern slope of the Sierra Nevada Mountains, Carson City once was known as Eagle Station and was a stopover for travelers headed for California in the 1850s. Explorer and military officer John C Fremont had earlier named the river flowing through the valley “Carson River” in honor of Kit Carson, the scout who led his 1843 expedition through the area when it was still under Mexican rule. When settler Abraham Curry bought Eagle Station in 1858, he renamed it Carson City, with plans it would serve as capital of the hoped-for Nevada territory, even setting aside 10 acres for a future capitol building. Nevada Territory was created in 1861, and territorial governor James Nye did select Carson City as capital. 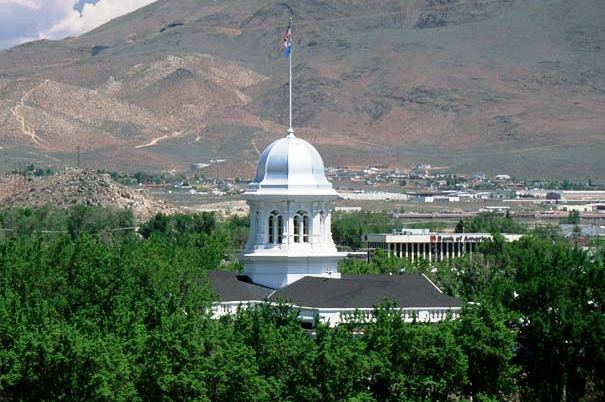 With Nevada statehood in 1864, Carson City remained as capital of the state, and its boundaries now include the entire county, with borders extending to the California state line. The capitol building was constructed in 1871 on that 10-acre plot originally set aside by Curry; it is Italianate in style with a small octagonal silver-domed cupola that is 120 feet tall. A complex of governmental buildings now surround the capitol, with a modern legislative building adjacent that was built in 1971. Although Carson City is one of the smaller capital cities today, its population grew rapidly during the silver stampede days of the 1800s. A US Mint was opened in 1870 to facilitate minting of silver from the nearby Comstock Lode. In all, more than $49,000,000 in gold and silver coins was minted there. The last coins were struck in 1893, but Coin Press #1 remains in what is today the US Mint Museum, along with displays of coins minted during that period bearing the “CC” mark. The Bowers Mansion, built in 1864, is an example of homes built with silver mine profits; the Nevada State Railroad Museum preserves the railroad heritage of Nevada, including locomotives and cars of the famous Virginia & Truckee Railroad and other railroads of the Silver State. The Stewart Indian School Trail is a walking tour of the off-reservation boarding school that housed American Indian youth from more than 200 tribes between 1890-1980; the 83 stone buildings are listed on the National Register of Historic Places. “Nevada Days” is celebrated every October with a parade and other festivities commemorating the state’s 1864 admission to the Union. Winter skiing is excellent in the nearby Lake Tahoe area, in the other direction is Virginia City, a popular tourist destination offering train rides and tours featuring the mining history of the famed Comstock Lode. The easiness of being there, the mountains close enough to touch, the awesome beauty everywhere. The genuine, the friendliness, the small-town gentle way of life, the peace. Mountains near: Sierra Nevada. Boundary Peak, on the western boundary of the state, is the highest point in Nevada at 13,147 feet.